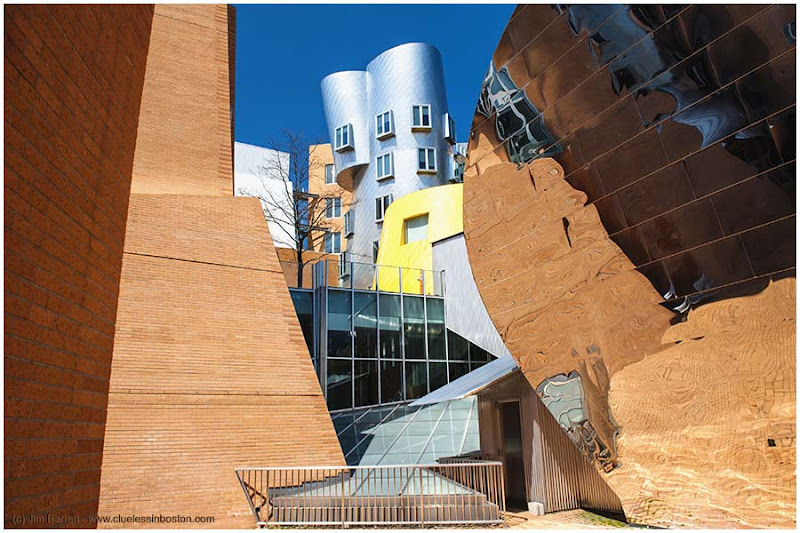 This is a section of the Stata Center at MIT. It is a must see if you ever visit the Boston area. You can see the front view from a post I did in June 2007. The building was designed by Frank Gehry; another Frank Gehry building can be found on Prague Daily Photo. Information on the MIT building can be found on MIT's website here. You are right. I must see this the next time I am up in Boston. I am traditional enough that I am not a big fan of Gehry. Maybe seeing it in person would change my mind. I would love visiting Boston someday! Your picture is wonderful, nice reflections! The color saturation and composition of this abstract architecture is gorgeous! This would make an eye-popping canvas in a modern setting.